Since October is Breast Cancer Awareness Month, and 1 in 8 women will develop invasive breast cancer during her lifetime (isn't that crazy? ), I thought it was a good time to pull together some tips and tools to help you help yourself to keep your breasts healthy. Our health is critical to our quality of life. This is why I feature health related content on a “homesteading” site, and why my first e-book is titled “Common Sense Health: Diet, Detox and Physical Activities“. 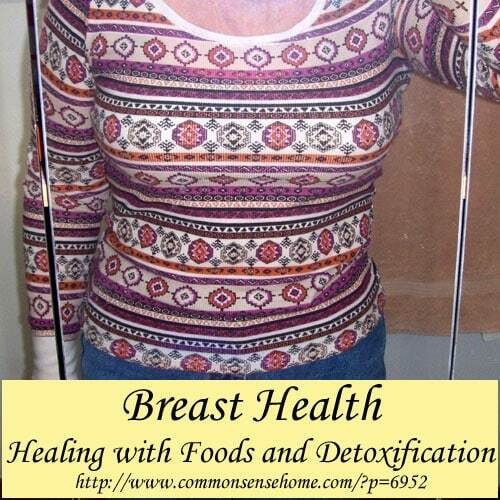 This post will focus on the diet and detoxification aspects of breast health. What Foods Help Keep Breasts Healthy? Vitamin D – While our bodies naturally create vitamin D from exposure to sunlight, most of us spend too much time indoors and/or with most of our skin covered up. The article “How to Cut Your Breast Cancer Risks Naturally” states that optimizing your vitamin D levels may reduce breast cancer incidence by 77 percent in four years. Vitamin D is critical to our overall immune system health as well, which is why colds and flus are more prevalent in winter when there is less sunlight available. Best Food Sources of Vitamin D – You may not like it, but cod liver oil blows everything else out of the water when it comes to vitamin D at 1,360 IUs per tablespoon. Other good sources include fish such as swordfish (566 IUs – 3 oz), salmon (447 IUs – 3oz), tuna (154 IUs – 3 oz), sardines (46 IUs – 2 sardines), beef liver (3oz – 42UIs) and egg – 1 large yolk (41 IUs). Note the these are approximate values only, as different brands of cod liver oil will vary, and grassfed/pastured animals will usually have higher vitamin D levels than their confined counterparts. Also note that larger fish may have higher levels of mercury. Omega-3 fatty acids, as well as their metabolite products, stop or slow the proliferation of triple-negative breast cancer cells better than cells from luminal types of cancer, researchers from Fox Chase Cancer Center reported at the AACR Annual Meeting 2013. Best Food Sources of Omega 3 Fatty Acids – In addition to the fish listed above, you can get omega-3 fatty acids from many sources, including ground flax seeds, walnuts, grass-fed beef and eggs from pastured chickens (or chickens fed flaxseed), beans, winter squash and pumpkin seeds (pepitas). World's Healthiest Foods has an article with more detailed information on the omega-3 content of various foods. Cabbage family plants include cabbage, broccoli, turnips, bok choy, Chinese cabbage, brussel sprouts, cauliflower, kale, radishes, and certain other leafy greens. Iodine – Iodine is critical for both breast and thyroid health, and is often overlooked. The book “Iodine: Why You Need It and Why You Can't Live Without It” by Dr. David Brownstein provides an in depth discussion on the relationship between iodine and breast health. Iodine deficiency has been linked to nodules and cysts in both the thyroid and breasts. Treatment with iodine has been shown to kill breast and thyroid cancer cells. *Note – always consult a trained healthcare provider for serious illness. Because iodine is required in both the breast area and the thyroid, Dr. Brownstein notes that treating an under-active (hypo) thyroid condition may actually worsen problems in the breast area because it boosts metabolism and increases the demand for iodine. This may potentially create a downward spiral unless the underlying deficiency is corrected. Dr. Brownstein's book focuses on supplements, and you can work with your health care provider to see if supplementation may be right for you. In Menopausal Years: The Wise Woman Way, Susun Weed recommends the consumption of natural iodine sources such as kelp (wakame, kombu or nereocystis) to nourish the breast and thyroid. She suggests high-quality powder dry kelp or dried pieces for snacking, 3-5 grams per day, or at least one ounce dry (by weight) per week. Brightly colored vegetables and fruits, mushrooms, different herbs including parsley and turmeric have also been shown in a variety of studies to have anti-inflammatory and anti-cancer properties. Avoiding highly processed foods such as hydrogenated oils, high fructose corn syrup, artificial sweeteners, colors and flavors is always a good choice for overall health. Don't Smoke – really, seriously, just don't, for so many reasons. I'd like to focus on the combination of excess weight and environmental toxins. Did you know that our bodies store toxins in fat cells to isolate the toxins from the rest of the body? This is why when people who have done drugs such as LSD lose weight they can have an acid trip from the drugs previously stored in their bodies as those drugs are re-released into their system. It's also one of the reasons it's so easy to regain excess weight that has been lost. If you don't take steps to remove the toxins while you are loosing weight, your body will try to put weight back on in self-defense. Thankfully, our body has a waste removal system known as the lymphatic system, as well as the ability to excrete wastes when we use the toilet. Unfortunately, little attention is given to our lymphatic system, which is really important when it comes to breast health. Our lymphatic system runs throughout our body, like the circulatory system that moves our blood. Unlike our circulatory system, it doesn't have its own pump, so it moves when you move – and most of us are moving less. We are also putting products on our skin that inhibit sweating (like antiperspirants and heavy lotions and creams) and may introduce more toxins into our system, such as aluminum and parabens, both of which have been found in breast cancer tissues. The majority of breast cancers are found in the upper outer quadrant of the breast – closest to the armpit. There is a concentration of lymph nodes in the armpit area (see diagram). These lymph nodes act as filters and trap foreign materials, which are then destroyed by white blood cells within the node. When things get clogged up it leads to trouble, including breast cysts and potentially breast cancer. Herbalix deodorants have been shown to help cure breast cysts. You can view thermographic images of a breast cyst patient treated with Herbalix Detox Deodorant in the post, “Lumpy Breasts? Cure Breast Cysts“. You can also read my review of Herbalix Deodorants in the post Herbalix Deodorants – Heal, Detoxify, Reduce the Risk of Breast Cancer“. Information on this website is provided for informational purposes only and is not intended to diagnose or treat any illness. Please see a healthcare professional for medical advice. This post contains affiliate links. Special thanks to my friend, Leigh, for providing the featured photo in her pretty seasonal top. I just bought a trial size of the herbalix detox deodorant, I think this is a great giveaway! Great article, I look forward to following your blog. I first learned about the toxic nature of most deodorants some years ago and I stopped applying every day, the went to once a week and now I only use them if I know I’ll be in a stressful situation. At the same time I started eating better foods and I think the combo has made a difference. No one has suggested that I need deodorant (and I’ve asked friends as well). I do need to get rid of some belly fat and hope that this could help. Awesome opportunity & great info! Thanks! Making time each week to go braless and antiperspirant free, and combining that with massage and the other detox options should help to improve circulation and move out toxins. Exercise is great, too, and saunas. Getting sweaty now and again is good for you. Just a quick note… I never wore a bra in my life and was diagnosed with breast cancer nine years ago at the age of 37, no family history. Thank you for sharing your story. Were there any other risk factors that you know of? To be honest, I’m of two minds – they haven’t found all of the genetic tumor markers, I went through the genetic testing and was negative, so if they haven’t found all of the markers possibly it was genetic. Or, and I lean more toward this, it is what we are being exposed to in our environment. I live in the Ohio Valley and we have a higher incidence of breast cancer, amongst other disorders/diseases. Recently I was listening to our local NPR station, they were interviewing docs who work in the infertility field. One of our local docs said he was talking to a doc in Chicago and when comparing notes, the doc in Cincinnati has to give a larger amount of the same drug to his patients in order to get the same result – ovulation. Leads me to believe we are being exposed to pollutants and due to being in the Valley it just hangs in our atmosphere. There are many areas that have generated cancer and auto-immune diseases in high numbers. When I first read the book “The Autoimmune Epidemic”, I was stunned at the numbers. (https://commonsensehome.com/the-autoimmune-epidemic-can-detox-treatments-help/). Worth checking out if you’re interested in more info. Thanks for linking to your sister-in-law’s blog. Thank you for such a common sense, practical article! I’m so tired of pinkwashing to raise money for a cure…how about prevention in the first place? This is a fantastic giveaway! You have no idea how badly I’d like to win 🙂 This is one of the few things I’ve seen for the pink month that actually makes sense to me! Nice article Laurie! I am an advocate for great diet and massage for many reasons! Keep posting about healthy lifestyle. As I’ve aged my health has become something I’ve been doing more research about. This is a great article about how what we put onto and into our bodies can affect our long term health. I’d love to win your contest. Woohoo! What a great giveaway! I grow weary of all of the pinkwashing, but this article was great! Bless you. Thank you for this post. My mother has breast cancer, a very aggressive sort, and is currently in chemo. She is a healthy weight and has never smoked, but she had the lowest vitamin D level her doctor had ever seen (11). Knowing that my risk is now more than double, I have endeavored to reduce all risks possible. I hope many women see this post and put it into action. Thank you so much for writing this. I’m always interested in more info on the menopausal years. I am going through it now. I don’t believe cancer of any kind can be prevented or cured. Having said that, I do believe that how we eat can have a great influence over our probability over our lifetime. Nutrients that help maintain optimal breast health, however, can not be abused, just like any other nutrients that aid other parts of our bodies. A balanced diet rich in whole foods from humane sources is the number one way in which we can care for our Selves with the best outcome. Are these products removing toxins through the skin or the lymph nodes? I’d love to win this…I’ve been trying to detox my life, and this would help! Just found your blog. Great information! Thanks! I would love to win this as I am dealing with some breast issues. A very scary thing! I am so glad you posted about this! I’m very intrigued about breast health and thryoid right now. I would love to know how these products have impacted your health. These sound like great products. I have just been thinking it is time to do some detoxing as I am seeing a return of symptoms that have been gone for a few years. Thanks for the giveaway. I’ve been a subscriber to your blog for some time now and I have to say it is absolutely one of my favorites. So many of your posts address something I have wondered or been concerned about. Thank you, Valita. That’s how I come up with many of my topics. I need answers! I didn’t know that about Cruciferous vegetables.I love cabbage soup! Gonna add some more tings to my diet for sure!! THANKS!! 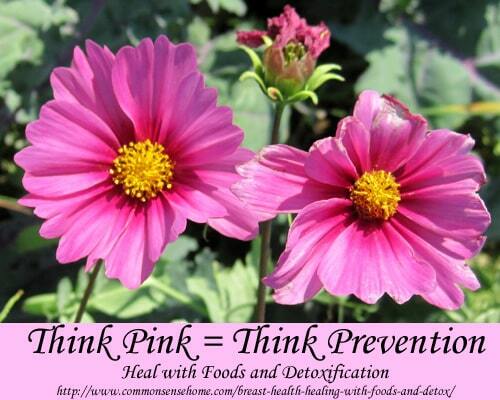 I love that you focus on prevention! Awesome! I’ve never heard of Herbalix and would love to try it. Been doing the dry brushing though and love how soft it leaves the skin as well as the health benefits. Herbalix products sound\ really interesting! I have to admit, I feel like I’m pretty ‘up’ on all things alternative health wise, but you have been a totally new source of information for me. thanks! I am always glad to see “real” things I can do to strengthen and protect my health. Thanks for the great info! Great article and awesome giveaway! Thanks! This is great information. Thank you for the giveaway. I had never read about some of the detox info or massage info. Excellent article! I’ve been wondering about a good way to detox. Thank you for this article. I think, you can never know too much about taking better care of yourself. I have been working on detoxing while exercising so that I can get the stored toxins flushed out of my system. Do you know if there is a specific binding agent for excess estrogen? I’m feeling the effects of the excess estrogen. Thanks. That’s beyond my experience. I would think you should be able to work with a trained naturopath or herbalist to find a protocol to help you promote healing. I appreciate the info and would love to try the detox deodorant. Strongly believe I am hypothyroid and am looking for natural ways to treat it. Thanks for this post and hope to win! I love the Herbalix nighttime detox deodorant and would love to try their other products. Love Herbalix products, and this is an excellent article! Every time I read an article about oil pulling there isn’t much said about doing it if you have anagram fillings. Is this a safe thing to do if you have anagram fillings? I would like to see more info about the menopausal years! Great giveaway! 🙂 I have been interested in the detox deodorant ever since I read about it in one of your blogs. Wowee. The stuff about LSD is crazy. I am not really curious. I was doing a detox w supps and it made me gain quite a bit of weight. I ended up stopping b/c of certain issues changing. Now I really wonder about it. It sure wasn’t fun – wonder if it was too much for me or what the weight gain signifies? There’s no easy way to tell for sure that I know of, short of taking a tissue sample and doing lab testing to look for contaminants, but I just wonder if you didn’t have some sort of protective reaction. I like this article! I want to know what sorts of bad habits or problems they had before having the impaired breast health. e.g bad diet, lifestyle and work environment etc. It varies by individual. There is a lot of lymph drainage through the armpit/breast area, so anything that disrupts lymph flow will have an impact. Breast tissue, like the thyroid, require iodine for health. If an individual is taking in too much bromine (through bromated flours or vegetable oils), this will disrupt iodine absorption.